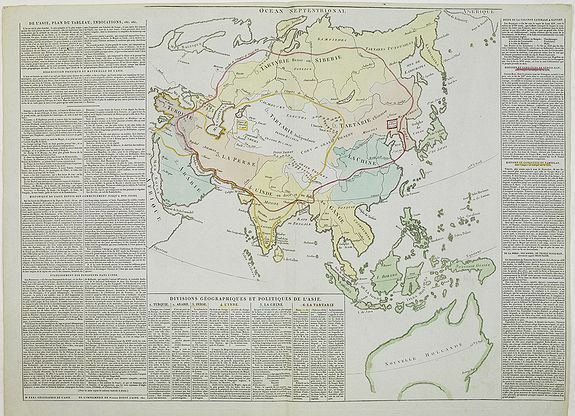 [Map of Asia] - DIDOT L'AINE, P.
Title : [Map of Asia]. Map maker : DIDOT L'AINE, P.. Size : 19.3 x 26.0 inches. / 49.0 x 66.0 cm. Description :Map of the continent of Asia with in the lower right corner the continent of Australia, labeled "Nouvelle Hollande", with only "Botany Bay" mentioned. The map is surrounded with text panels giving a historical description of the region. From " Géographie de l'Asie". The map is of interest for the use of East Sea, the sea between Korea and Japan, here called "Golphe de Corée". A red-line is indicating the empire of Genghis Khan of 1226 (just before he died in 1227). He was the founder, Khan (ruler) and Khagan (emperor) of the Mongol Empire, which became the largest contiguous empire in history after his death. A yellow line is showing the border of Tamerlan Empire of 1406. Tamerlan real name was Timur, from the Turkic word for "iron." The European versions of Timur's name -- "Tamerlane" or "Tamberlane" -- are based on the Turkic nickname Timur-i-leng, meaning "Timur the Lame." Timur was born in 1336, near the city of Kesh (now called Shahrisabz), about 50 miles south of the oasis of Samarkand, in Transoxiana. With Central Asia in hand, Timur invaded Russia in 1380. He helped the Mongol Khan Toktamysh retake control, and also defeated the Lithuanians in battle. Timur captured Herat in 1383, the opening salvo against Persia. By 1385, all of Persia was his. With invasions in 1391 and 1395, Timur fought against his former protege in Russia, Toktamysh. The Timurid army captured Moscow in 1395.